Back in Al Capone’s day, Prohibition helped give rise to a rash of epic crime-boss fortunes. In our day, deregulation has spawned on Wall Street an entire new generation of fabulously rich racketeers. 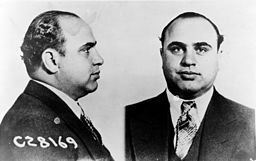 Al Capone’s thugs threatened businesses, then sold them “protection.” Today’s banking racketeers rent businesses storage space for commodities, then refuse to return the commodities they’re storing. What crimes did Al Capone, the notorious 1920s crime boss, have his henchmen commit? Did Capone’s thugs go around robbing convenience stores? Did they burglarize homes? Or lurk in the shadows and mug innocent passersby? None of the above. Capone and his fellow kingpins of “organized crime” left high-risk, low-return illegality to the lowlife. Kingpins like Capone ran rackets instead. They sold “protection.” They loan-sharked. Most lucratively of all, they bootlegged outlawed alcohol. Rackets like these guaranteed returns both steady and steep. Capone at one point was clearing $100,000 a week. Racketeering, of course, is still going strong. But the getup of our contemporary racketeers has changed somewhat. Our most highly compensated racketeers today don’t wear fedoras. They fill power suits. Our top racketeers these days don’t run from the law. They run Wall Street. Most of us imbibed our first inkling of this Wall Street racketeering after the economy melted down in 2008. We soon learned that America’s biggest banks had been nurturing systematic fraud for years, bankrolling mortgage operations that thrived on phony appraisals and “liar’s loans,” then slicing and dicing the resulting junk mortgages into exotic securities they marketed, for exorbitant fees, to unwary investors. Eventually, this whole house of marked cards collapsed, and millions of families lost most everything they had. But taxpayer bailouts would keep Wall Street flush — and searching for new twists on old rackets. But this summer’s most riveting big-bank racket doesn’t revolve around financial industry paper. This racket impacts things we can actually touch and feel, like the beer cans millions of Americans will be holding next week at Labor Day picnics. By the 1960s, lawmakers had put into effect a variety of regulations that kept banks restricted to banking. But these restrictions would start eroding as deregulation — and America’s plutocratic restoration — started gaining serious momentum in the 1980s. Then in 2003 the dam broke. The Federal Reserve Board, as one expert analyst told a Senate hearing last month, “razed the walls between deposits and commerce” and allowed Citigroup to buy up a nonfinancial business. In 2005, another Fed waiver let JPMorgan Chase enter the physical commodities business. No bank rushed more boldly than Goldman Sachs. Three years ago this Wall Street giant bought up a string of 27 aluminum warehouses around Detroit. Industrial users of aluminum use warehouses like these to store, until their factories need it, the metal they buy on the global market. Before Goldman’s entry into the commodity business, aluminum warehouses would deliver metal to end-users in a timely fashion, typically about six weeks. With Goldman in charge, that timeliness started slipping, all the way to 16 months. Beverage companies and other manufacturers found themselves paying huge additional storage fees — to Goldman — for the added time. In 2011, angry Coca-Cola officials formally complained to the metal industry’s global self-regulatory body, the London Metals Exchange. Coke charged that Goldman had “intentionally created” a warehouse bottleneck to drive up the global price of aluminum and cash out on speculative windfalls. The Metals Exchange, a private body with bankers among its decision makers, feigned deep concern and then doubled the amount of metal that warehouses must ship out daily. Goldman never missed a beat. The bank, to meet the new rule, simply started shipping aluminum bars from one of its warehouses around Detroit to another. The Times estimates that this “merry-go-round of metal” has cost consumers about $5 billion over the past three years. In 2012, Goldman’s top five execs together took home $92 million. Wall Street’s leap into commodities has, over recent years, gone well beyond aluminum. Last December, the Securities and Exchange Commission gave a big-bank syndicate the green light to buy up and warehouse up to 80 percent of the world’s copper. But the penalties exacted on the big banks so far have been ridiculously slight. One example: Earlier this summer, the Federal Energy Regulatory Commission penalized JPMorgan for parlaying control over a dozen California power plants into a scheme that defrauded consumers out of $125 million. JPMorgan now has to pay back the $125 million, plus another $285 million. This $285 million — one day’s net revenue for JPMorgan — doesn’t make for much of a deterrent, observes Los Angeles Times analyst Michael Hiltzik. The Federal Reserve Board has the power to undo the deregulation that has opened the door to big-bank control over nonfinancial commerce. Indeed, several key waivers that the Fed has handed out to major bank holding companies, unless renewed, will expire next month. In Senate testimony last month, Joshua Rosner, a managing director of the research firm Graham Fisher & Company, called on the Fed to make a regulatory about-face. Al Capone liked things that way. Racketeers always do.